We purchased three packages of bees in 2013. However, about a month after we had installed the hives, one of the hives abscounded. And during the winter of 2013-2014, we lost another hive due to starvation. The remaining hive, which made it through the winter, later provided us with about 8 pounds of honey in August. Needless to say, it was the best tasting honey we have tasted so far!! 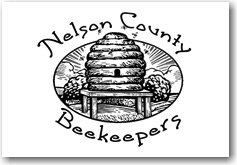 We purchased two more packages of bees in April 2014. One of the hives abscounded within a couple of days (I believe they left within a few hours after being installed into their hive.) The second package lasted until January 2015, when I noticed that the colony had died. Cause may be due starvation and freezing. In March, we lost our second hive because of a hard freeze (below zero) weather. HiveTracks A very interesting source of information, provided to me via e-mail from Susan and Jack, entitled: "The Guide to Beekeeping for Adults and Kids". Thanks, Susan & Jack!